(TB30DNV) GeoCoins.net Trackable Token Geocoin - Todie's Wild Ride: Share the road! Todie's Wild Ride: Share the road! Use TB30DNV to reference this item. To spread motorcycle and bike safety awareness throughout the world! I'd like to make a stop at the island of Rhodes in Greece, but my message is needed everywhere! This coin is being released as part of the Todie's Wild Ride Bike Awareness Project initiated by Rockin Roddy in response to the death of his good friend Tod Phillips. On August 12, 2008, Tod was riding a motorcycle when he was killed in an accident caused by a left turning vehicle. Tod was one third of Team Rod & Tod w/KAboom. This coin is released in his memory and in memory of all motorcyclists and bicyclists killed on the road. Please remember, driving is a responsibility, not a right. Being in a rush and trying to shave off a few seconds isn't worth someone else's life. Always, always look! Don't assume the coast is clear! Gallery Images related to Todie's Wild Ride: Share the road! Not spotted at Rengstorff Rätsel. Sorry. 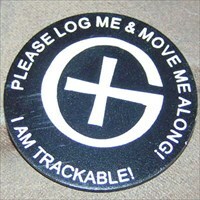 This trackable is no longer in the listed cache. Hopefully it will be logged somewhere else and reappear. Nice location from which to continue its journey. My Very first Trackable! I'm saving this one for our next big road trip!